Nerve Testing: What, Why, When & How? Nerve testing, also known as a nerve conduction velocity (NCV) study, is a diagnostic tool used by the spine specialists at the Southeastern Spine Institute. The SSI campus in Mt. Pleasant combines a number of different departments under one roof, so physicians of different specialties often collaborate. As a result, SSI conducts truly comprehensive nerve testing in South Carolina. Your nervous system is composed of nerves that carry electrical pulses. These pulses send information to and from your brain. But your nerves are not like electric wires. Sometimes a nerve can be damaged, pinched or irritated. And as you age, your nerves can degrade too. When something happens to your nerves, they stop being as efficient as they used to be. This can cause pain, numbness or tingling in your back or extremities. Your spine physician may order an NCV for you if he suspects nerve damage or impingement. Along with a complete physical and a description of your symptoms, an NCV will help him reach a diagnosis. Since proper treatment can begin only after the diagnosis, this is an important step toward relieving your pain. Why Is an NCV Test Performed? If you are experiencing numbness or tingling in your arms or legs, there may be many causes not readily apparent. To diagnose your condition properly, the spine specialists at SSI must determine the source of your discomfort. One way to do this is to narrow the possible causes, eliminating those that do not hold up to the evidence gathered through testing. 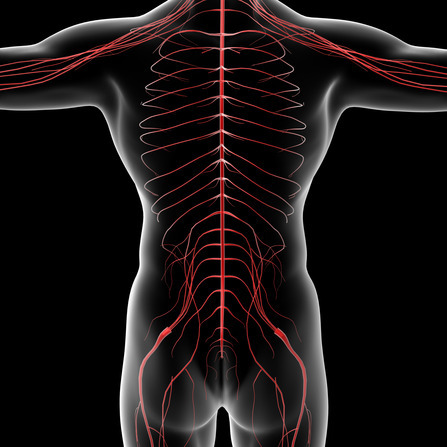 An NCV study can tell your physician if your nerves are causing your pain. If the test does turn up problems, your spine physician can prepare a treatment plan to help you. If your test comes back negative, meaning there was no evidence of degraded nerves, your doctor can cross that off the list of potential causes and continue his search for the real problem. When Is an NCV Test Performed? Nerve testing in SC is usually performed early in the diagnostic phase to determine if you are experiencing any nerve damage. If you have had back surgery or any other invasive procedure, however, your spinal physician may want to do an NCV test to determine how well you are responding to the treatment. The spine specialists at SSI can perform an NCV whenever it is needed right on campus. You do not need to go to the hospital or another office. Everything for spinal medicine is under one roof at the Southeastern Spine Institute. The NCV procedure itself is relatively painless and lasts only about 30 minutes. While you are lying down, a technician attaches small electrodes on your skin at very specific places, depending on the nerves to be tested. The electrodes adhere best to clean skin, so it helps if you’ve showered before the procedure. Also, do not use oils or lotions on the day of your test. Then the technician stimulates the electrodes with a low electrical pulse. The NCV test measures the speed at which that impulse travels. Damaged or injured nerves will carry that impulse slower than healthy nerves. During the procedure, you may feel some slight discomfort as the electrical pulses race through your body, but it is completely safe, even for patients who have pacemakers. Given the short duration of the test and the mild discomfort, you likely will not receive any medication before the test. Nerve testing in SC is often ordered in conjunction with an electomyelogram (EMG), which measures how well your muscles respond to electric signals. Although the two tests are administered differently and test different systems, they can be done on the same day. Both serve to pinpoint the cause of your symptoms. For more information about nerve testing in SC, contact us.